Blood that flows between different chambers of your heart must pass through a heart valve. These valves open up enough so that blood can flow through. They then close, keeping blood from flowing backward. The tricuspid valve separates the right lower heart chamber (the right ventricle) from the right upper heart chamber (right atrium). 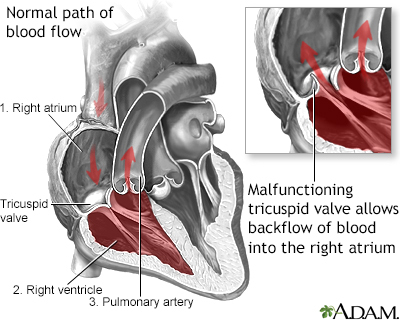 Tricuspid regurgitation is a disorder in which this valve does not close tight enough. This problem causes blood to flow backward into the right upper heart chamber (atrium) when the right lower heart chamber (ventricle) contracts. 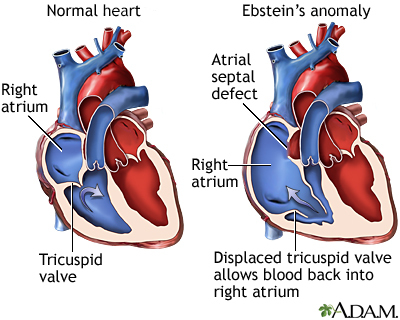 A type of heart defect present at birth called Ebstein anomaly. Carcinoid tumors, which release a hormone that damages the valve. Past use of a diet pill called "Fen-Phen" (phentermine and fenfluramine) or dexfenfluramine. The drug was removed from the market in 1997. The health care provider may find abnormalities when gently pressing with the hand (palpating) on your chest. The provider may also feel a pulse over your liver. The physical exam may show liver and spleen swelling. Listening to the heart with a stethoscope may reveal a murmur or other abnormal sounds. There may be signs of fluid buildup in the abdomen. 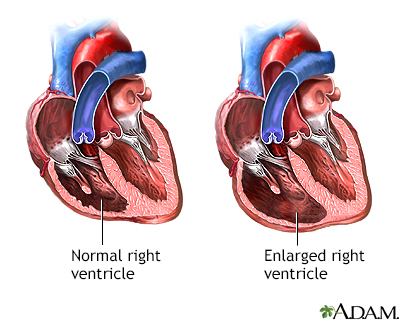 An ECG or echocardiogram may show enlargement of the right side of the heart. Doppler echocardiography or right-sided cardiac catheterization may be used to measure blood pressure inside the heart and lungs. Other tests, such as CT scan or MRI of the chest (heart), may reveal enlargement of the right side of the heart and other changes. Treatment may not be needed if there are few or no symptoms. You may need to go to the hospital to diagnose and treat severe symptoms. Swelling and other symptoms of heart failure may be managed with medicines that help remove fluids from the body (diuretics). Some people may be able to have surgery to repair or replace the tricuspid valve. Surgery is most often done as part of another procedure. Surgical valve repair or replacement most often provides a cure in people who need an intervention. The outlook is poor for people who have symptomatic, severe tricuspid regurgitation that cannot be corrected. Call your provider if you have symptoms of tricuspid regurgitation. Treat strep infections promptly to prevent rheumatic fever. Always tell your health care provider and dentist if you have a history of heart valve disease or congenital heart disease before treatment. Some people may need to take antibiotics before having a procedure. Prompt treatment of disorders that can cause valve or other heart diseases reduces your risk of tricuspid regurgitation. Pelikka PA. Tricuspid, pulmonic, and multivalvular disease. In: Zipes DP, Libby P, Bonow RO, Mann DL, Tomaselli GF, Braunwald E, eds. Braunwald's Heart Disease: A Textbook of Cardiovascular Medicine. 11th ed. Philadelphia, PA: Elsevier Saunders; 2019:chap 70.